Satisface a tu paladar con las delicias culinarias del sur de Vietnam en un recorrido culinario de 2.5 horas por la ciudad de Ho Chi Minh. Con una guía gastronómica experta, sumérjase en la vibrante atmósfera de los mercados locales y los restaurantes rústicos para degustar especialidades locales, como baguettes 'bahn mi' y populares arroces. Tome un aromático café saigón y refrescantes cervezas mientras explora las apetitosas atracciones de Ciudad Ho Chi Minh. Disfrute de un ambiente íntimo en esta gira en grupos pequeños, donde los números se limitan a solo 12 amantes de la comida. Experimente la historia y el multiculturalismo de Saigón a través de su comida. 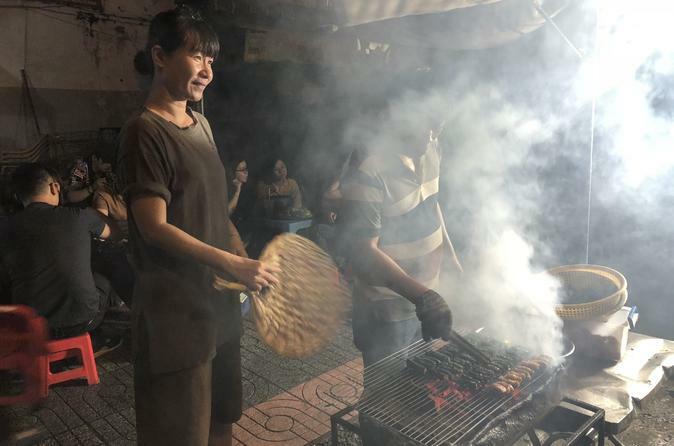 Salude a su guía y grupo de amantes de la comida en el Museo de Bellas Artes de la ciudad de Ho Chi Minh. Inicia tu recorrido en algunos puestos cercanos de la calle donde puedes probar aperitivos locales como chao muc (gachas de calamar seco) y xa xui (cerdo a la barbacoa cantonesa). 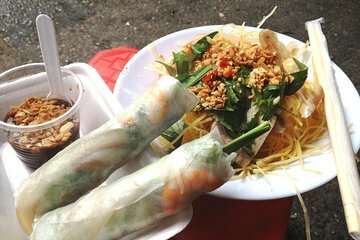 Continúa hasta la esquina de Nguyen Cong Tru y Calmette, y prueba una comida callejera única llamada banh bo banh tieu . Después, dirígete a un área popular por su café saigonés. Vea por qué los lugareños son todos acerca de esta taza de joe en particular antes de pasar a la muestra ha cao (dim-sum de estilo chino), bo bia (un rollito de primavera de Saigonese) y bo cuon mo chai (albóndigas de ternera a la barbacoa). Termine su recorrido con un plátano frito vietnamita como postre y una cerveza Saigón. Luego, haga una oferta a su guía y grupo de despedida en este bullicioso lugar y elija continuar explorando o tome un taxi de regreso a su alojamiento. First day in Saigon so this was a perfect start introducing me to street food of Vietnam . As solo traveller it was ideal to meet new people on holiday . our guide Lucas was on time, very friendly and engaging - our walking food tour was more like a night out with friends - food was very good, lots of it and different types - walked thru areas we probably wouldn't have know to go there - overall we had a great time , would do it again. An excellent way of exploring the city! The tour guide was fun, on-time and all the food we tried were delicious. I highly recommend it. Come Hungry for this tour as there is plenty to sample !! So many dishes and drinks all very tasty !! Let me start by saying that my husband and I LOVE food tours. The Ho Chi Minh City Street Food Tour was no exception. Our tour guide, Tan, led us into food stalls and restaurants that were clearly reserved for locals. We enjoyed duck, Vietnamese coffee, taro and eggs, BBQ, Saigon Beer and more over the course of this 2.5-hour tour. Yum! If you love food as much as we do, take this tour and make your stomach happy. We had a great time on this tour and our tour guide was fantastic! Highly recommend this tour. Do be informed that it is a walking tour with a considerable amount of walking. We were fine with it and found it to be very helpful to us as it lessened the guilt from eating too much. Do be informed that most of these street food vendors aren't in spotless clean dining areas but in the streets beside the road literally on the pavement where it may be perceived to be unhygienic and dirty. If you may have a problem with that then this is definitely not for you. We were fine with it as it gave us insight into the locals' way of life. Do be prepared to be super full from eating a wide variety of food. Do be prepared to gain valuable knowledge about Vietnam in many aspects. Do be prepared to learn how to drink your coffee the Vietnamese way as opposed to the Starbucks way. The night ended on a high note and our tour guide Tan was also kind enough to let us know to only use VinaSun taxis to find our way back to the hotel. Thanks a lot to Tan for making the whole experience a positive one for us. Awesome! Awesome Tour! Good Food, Great Tour Guide, Great Group of People. It rained at the beginning, but the tour guide offered ponchos, which was great. Keep close to the tour guide, with a lot of motorbikes and traffic, you don't want to get run over. Highly Recommend!